There’s only one catch. She must also stop the rebellion that Lila secretly fostered, the same one that got her killed and one Kitty believes in. Faced with threats, conspiracies and a life that’s not her own, she must decide which path to choose—and learn how to become more than a pawn in a twisted game she’s only beginning to understand. Review: I’ve read some volumes in the first Aimee Carter’s series and I enjoyed them, so when I saw the release of a whole new story I was immediately intrigued. And what more can we ask for than a dystopian novel? I confess that I have not read a lot of them, but I think it’s always really fascinating. Then, it is true that this novel had a little something which made me think to the Hunger Games series, but I think you should read it to understand that. Kitty is a girl like any others, and as each person at her age, she must pass a test to find out what she will do in her future. Indeed, each person is marked with a number for life and must submit to what it means. However, the test does not happen at all as she had hoped and now here she is with a III. A figure that means she will have to leave her town, her friends, her family and her boyfriend she loves: Benjy. She can not accept that! But when after some terrible circumstances, the Prime Minister asked her if she would like to change her number and become a VII, she sees this as an opportunity to escape her new life she already hates. But she did not expect that this change comes with a price so high. Physically changed so that she now looks like Lila Hart, the niece of the Prime Minister, she is torn from everything she knew and is forced to take the place of the dead girl to calm the rebellion established. She will also be helped by Celia, Lila’s mother who is fairly enforced and by the fiancé of the girl who seems too good to be honest. I loved this story. Kitty really has no choice now that she has become Lila. She must learn everything about the girl and her role or be killed. You can suspect that she will then take her role to heart, especially when the Benjy’s life is put at stake. It’s really sad to see how she is processed and pulled from all sides. While Celia and Knox want her to fuel the rebellion formed, the Prime Minister and his mother want her to become their pawn and calm everyone. And it will not be easy for the girl to choose sides, especially for her own survival. But Kitty has a highly developed survival instinct and she is ready to do many things to keep it that way. She also discovers what it means to be a VII, something that is not always that easy, especially whole torned on all sides, where conspiracies and hatred constantly mixed with family. I was immediately intrigued by Knox, the boy who becomes her new boyfriend. He is very nice to her and does everything to help her. Yet we feel that there is more and it is true that I was more than surprised when I discovered his true nature, same as Celia’s. I did not really expect that and I was just as surprised as Kitty, and even hurt that he kept so many things from her. She will have to stay strong and keep her head clear from all the lies and half- truths coming from all directions. I was really impressed by what she was able to do in such circumstances. It was a really good story and we are surprised by many points throughout the novel. It’s a fascinating dystopia and I took great pleasure in discovering it. I was eager to see if an uprising would happen and if Knox and Kitty were to become something, if Benjy would appear and find the girl. I’m very curious now to read more, I’m really looking forward to have the second novel. This entry was posted in Aimée Carter, Dystopia, The Blackcoat Rebellion, Young Adult. Bookmark the permalink. Not my cup of tea, but I am glad you enjoyed it. That’s what’s fascinating about reading fantasy YA novels, the internal conflict the characters is forced to go through. Anakin Skywalker moments I call them. And I love the name Kitty, it’s not a « strong » name for a heroine which is a great contrast to her character it seems. 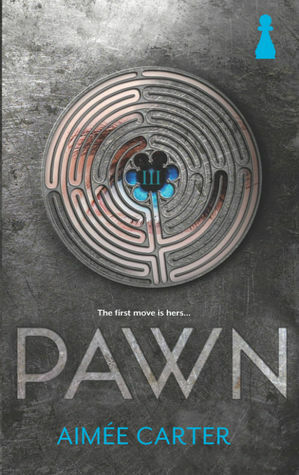 I have read other reviews about Pawn as well, and most have been very positive. I need to read this myself – it’s exactly the kind of book I usually enjoy! I’ve been curious about this one and now I know I need to read it. I like the sound of Kitty! I wasn’t a fan of Aimee’s other series but this one was really unique and a fun read! I keep seeming to run across books lately with the name Kitty as a main character. I am excited that you loved it since I recently recieved it! I’ve grown a bit tired of dystopias altogether, but this has been getting such wonderful reviews. And the very fact that it managed to surprise you and affect you so strongly certainly works in its favor. I think I’ll read it after all.